Animations bring actors to life. They represent the visuals of an actor, its collision bounds and the notion of being in a certain "state" - such as running, walking and jumping. What are examples of animation states? What does an Animation Consist of? Frames are like pages in a flipbook. Each frame represents a a different image or "page" in the book. When these images change quickly over a period of time, the result is an animation. Collision Bounds determine the physical shape(s) that an an actor assumes in a particular Animation state. Now that you understand what animations are, let's go over the import process. You can import animations in one of several ways. In this instance, we're assuming you've already got an Actor open in the Actor Editor. Click on Click here to add frame under the Frames pane. You'll now see this dialog. Click the Choose an Image... button and pick out the desired image. Want to follow this exact example? Use this image. Now, configure columns and rows to break up the image, as appropriate depending on how many cells it has in those directions. If applicable, enter in values for the border and spacing fields. The majority of images do not need to worry about these fields. Click Add to complete the process. That's it. 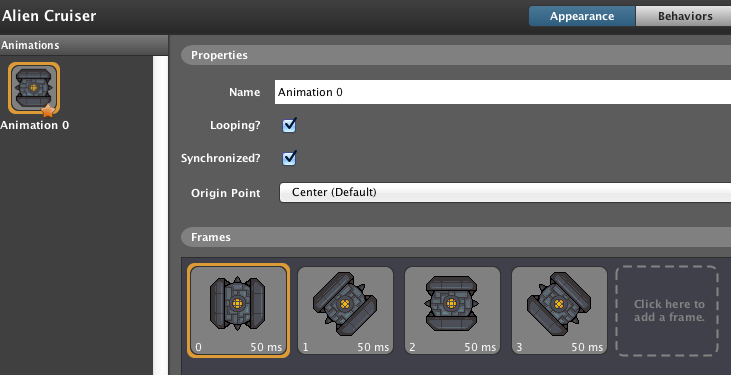 After importing frames, you can give the Animation a name, alter frame durations and other properties we described above. Note: Mobile games have to import images at quadruple their size in order to accomodate larger resolution displays. Read our Scaling article for details. You can drag and drop an image into Stencyl while the Actor Editor is open. Doing this will bring up the dialog you see in Step (2) of the standard method. 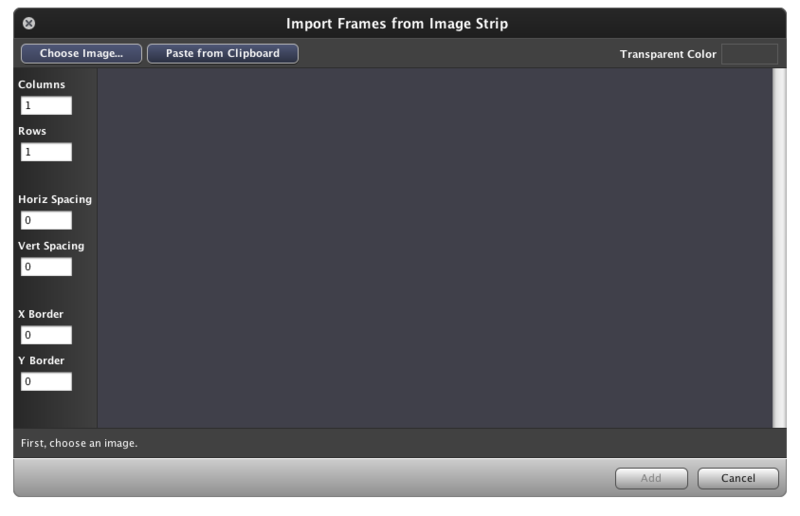 Dragging in an animated GIF will bypass the dialog and immediately import the frames. Dragging in an image to the Dashboard or an editor that is not the Actor Editor will have varying effects, none which will import a new animation for the current Actor. Now that you've imported an image, you'll see its details, We'll step through what each part means. Each animation state is given a name, which you use when you want to switch animations. Frames can be set to loop or play through just once. Synchronized animations will animate in at the same time as each other. To put this more concretely, think about the coins in a Mario game. Have you noticed that their animations always look the same no matter what? If this weren't the case, it would look disconcerting. An Animation can also have a designated origin point. The origin point is used to determine the point by which an actor rotates or scales. By default, this is set to the center point. Every frame can be given a different duration (in milliseconds). 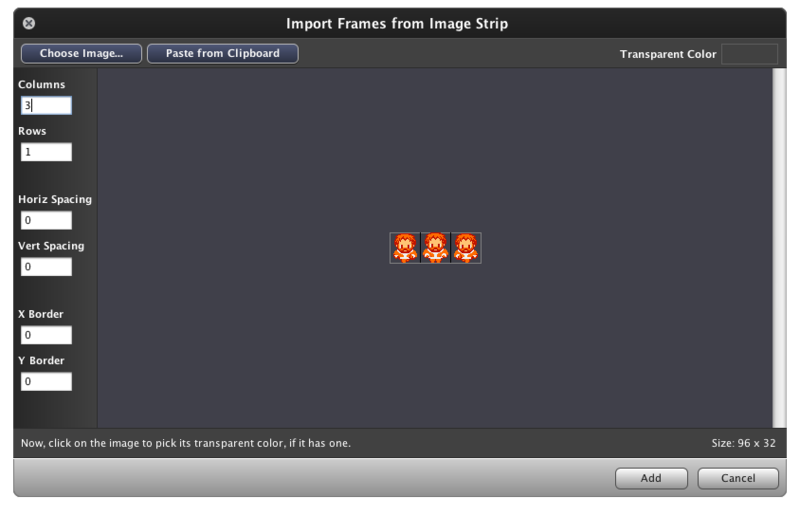 Double-click each frame's box to edit the duration. Notes: The minimum duration is 10ms. To edit multiple frame durations at a time, select multiple frames (using SHIFT or CTRL/Command) and click Edit Frame in the bar below. 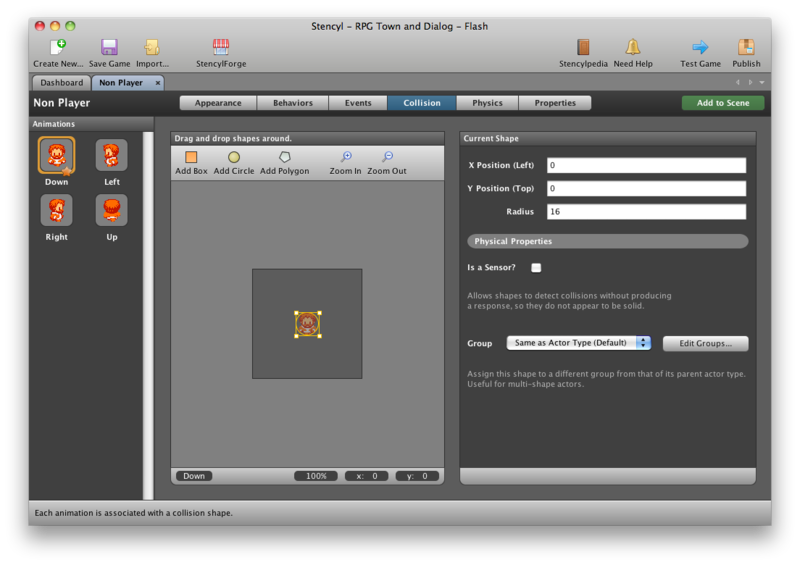 Individual animation frames can be edited in an external editor. This is useful for making small tweaks to the graphics, without having to re-import the whole animation. 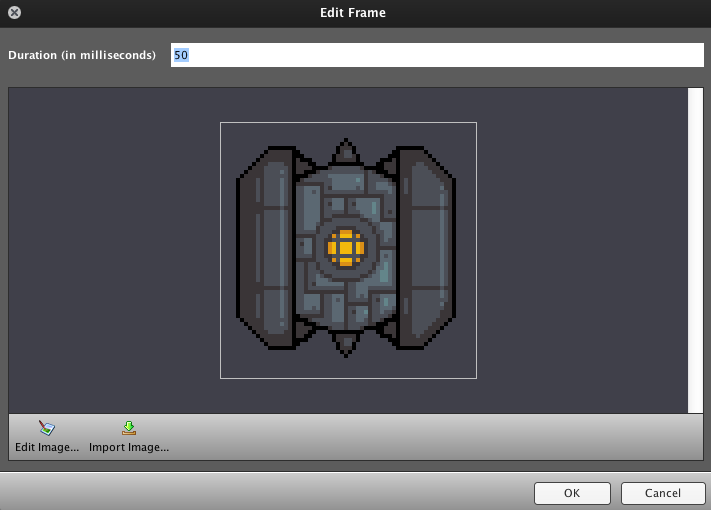 Double-click a frame's box to bring up its edit dialog. Then, click the Edit Image button to open it up an external editor. Note: You set the External Editor from Stencyl's Preferences dialog. By default, we use an image editor that we bundle in, but you can set it to any app you like, such as Photoshop, GIMP or Paint.NET. To define Collision Bounds, flip to the "Collisions" page of the Actor Editor. There, you will be able to edit your Animation's Collision Bounds on a per-animation basis. We cover how to define Collision Bounds in our Collisions article. All of these blocks are found under Actor > Drawing. This block switches the actor's animation to the one you specify. Note: Do not type in the animation name directly. Instead, use the "as animation" block and type the name into that. This block returns the animation that is currently playing. Note that this returns the animation, not the textual name of the animation. Is the current Animation still playing? Returns true if the current animation is still playing, otherwise it returns false. This is only useful for animations that aren't set to loop. This block lets you skip around an animation or reset an animation to its starting frame. Specify the frame index you wish to jump to. Note: Frame indices are displayed in the gray boxes and start from 0. Switching to an invalid frame leads to nothing happening. This block reports the index that the animation is currently playing. Tip: This is useful when you want to tie some logic that's triggered when a certain index is reached. In animation terms, this is called a keyframe. This block reports the total number of frames in the current animation. Design Problem: More Animations or More Actors? There is no limit to the number of animations an actor may have. However, it's best to consider when it's appropriate to go with more animations or whether it's better to create a brand new actor. The "Zelda" Dilemma is a classic game design problem you run into when making an Adventure game and decide how you want to create your Hero character. So suppose that we start with just the basic animations. Not to bad so far. But Link holds a sword! So we have to add 2 more sets of animations, one for holding the sword and one for slashing it. But wait, there's more! Link changes swords throughought the game. He can hold the plain sword, the Master Sword and the Golden Sword, and they all look different! That would triple the animation count. And what about the Bow and Arrow, holding a shield and... you get the picture. In cases like these, it's better to create a new actor rather than add more animations. This is particularly applicable when an actor equips items that don't alter his animation and could be convincingly drawn separately. There are other benefits to having "attachments" as different actors. Easier to define collision bounds, particularly for weapons. Confines extra behaviors to the separate actor, rather than creating 1 monolithic actor with everything. It's best if all animations are the same size. It's often necesary to ensure that all animations of an actor are equal in size. Making animations different sizes, for the same actor, could have a negative impact, especially if the origin point is different in each animation. The actor magically jumps to a slightly off-center location when you switch animations. The actor's collisions mess up because the new animation has the collision bounds located in a different part of the animation. Note that when using the "switch animation" block, you cannot type text directly into the blank. Instead, you have to wrap that text inside an "as animation" block like the following. 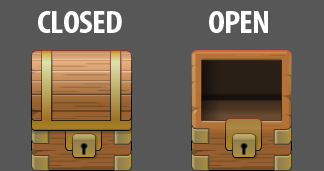 Reminder: All animation-related blocks are located under Actor > Draw. Actors with no animations at all may crash the game. We'll address this in a future version of Stencyl. Note that this is different from an Actor with a single blank (0 frame) animation, which will work just fine. Animations are states, such as standing, walking and running. Animations consist of frames (how it looks) and collision bounds. Exercise good judgement in deciding whether to go with an actor with many animations versus several actors with fewer animations. We talked about the "Zelda Dilemma" above. Now's your chance to see this for yourself and do things the right way. Create a simple walkaround demo in which the character can equip different items that show up in that character. Do this the right way, by making those items each their own actors. I can't seem to find the "as animation" block in the Actors > Draw section. Is there (plans for) support for the file types created specifically by animation software? I'm asking as a user of Graphics Gale Free Edition, which uses .gal. In a nut shell, here is the official website, which contains a feature overview: http://www.humanbalance.net/gale/do wnload.html. I'm sorry if this inquiry has been previously answered--please redirect me if so. Stencyl Ninja's comments are on the mark. The point of these embedded challenges and design discussions is to get you to think about common problems you may encounter. Some of these, I've seen with my own eyes when projects came my way (as part of bug reports). Rather than telling you the answer straight away, we go through the thought process, so that you develop your thinking skills and can tackle new problems for which Stencylpedia has no answer. If the challenge's solution is obvious, that's great. You can gloss over it. But for many, it isn't. I could simply use some pointers on learning how to actually draw and animate our own material, as in what software I should use, etc. That would really help me out. There is a typo in the "note" box in the drag and drop. The typo is noting when it is supposed to be nothing. can i draw the actor and use it ?????? of the Sword the same size as the corresponding Link animation frame. You still have to make the animations of the sword, just synch them up. The Challenge is just saying to separate the sword's animations from the character's animations. Two separate actors rather than just one actor with ridiculous amount of animations. The hard Part would be what some of these guys are trying to do because they misunderstood the challenge. on the Link actor, and then have it rotate and/or move in certain ways to animate it. I actually used this way back in The Games Factory and it worked well, but The Games Factory had 2 kinds of hotspots. There was the Origin Hotspot and then there was a Spare Hotspot upon which I would place a weapon. Does Stencyl have 2 hotspots and the ability to simply place one actor to another actor's hotspot? like was available in The Games Factory. Are animations still stored in lines? I was under the impression the were now stored as rectangles.